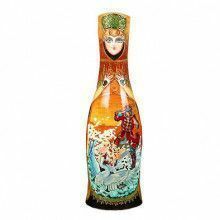 This Russian Bottle Holder is lathed from linden wood and is richly decorated by beautiful miniature hand-painting similar to the highly collectible Russian Nesting Dolls. It is used to keep a liquor bottle inside. Great gift for a Housewarming party, Wedding, Anniversary, Birthday, and just for yourself to decorate your bar.